Bible publishers are beginning to identify a need and a desire to emphasize the simplicity and centrality of the text. The Kickstarter project Bibliotheca led the way with 15,000 backers contributing $1.4 million toward a 4-volume set that promised to strip away all of the extraneous details while emphasizing the highest quality of typography, printing, paper, and binding. It offered simplicity and beauty over against clutter and utility. It looks like the project will deliver on its promises, though it has been hampered by long production delays and an unpopular, inelegant translation. 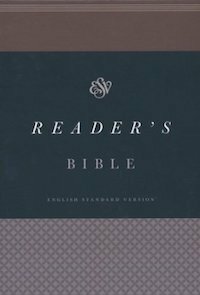 Beating it to market, and in a much superior translation to boot, is the ESV Reader’s Bible. 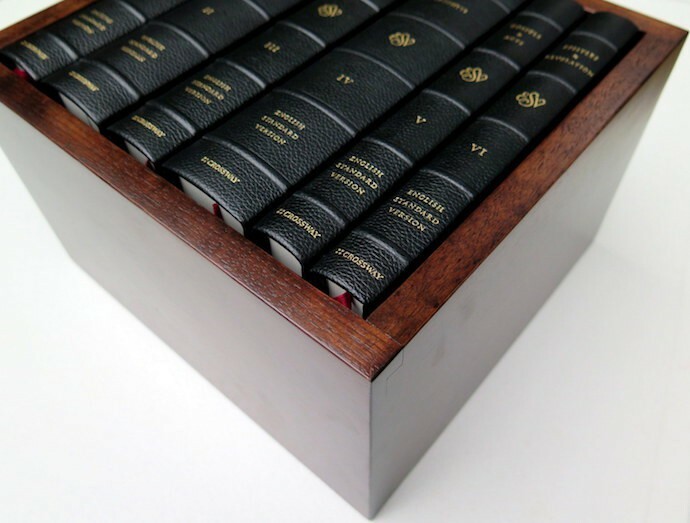 The ESV Reader’s Bible is available in two variations: cloth over board and cowhide leather over board (the variation I received from the publisher for review purposes). 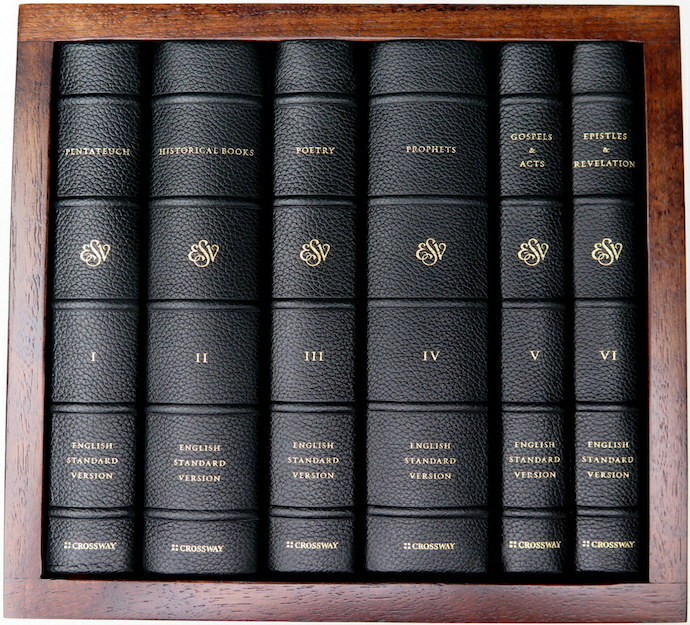 Both have smyth-sewn bindings (the highest quality binding available, allowing the books to lie flat when open), measure 5.25 x 7.75 inches, and come as a six-volume set: Pentateuch, Historical Books, Poetry, Prophets, Gospels and Acts, and Epistles and Revelation. The paper is high quality with a subtle cream tone (uncoated 80GSM Munken Premier Cream). It prevents most bleed-through while providing a good surface for marking in pen or pencil. 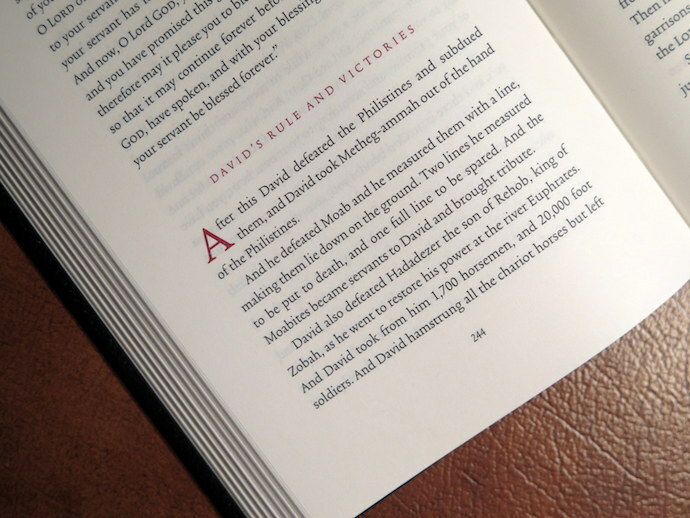 The text is set in a 12 point Roman font and produces the 2016 ESV Permanent Text. The leather over board variation comes in a handcrafted walnut slipcase while the cloth over board variation comes in a handsome board case. Each volume is a beautiful book in its own right—a book that strips away nearly everything that might threaten to displace the text. The text is printed in a single, paragraphed column free of all verse numbers, chapter numbers, footnotes, or annotations. It displays the title of the book (flush left at the top of even-numbered pages), the current heading (flush right on the top of odd-numbered pages), and page numbers (centered on the bottom of each page). And that is all, apart from titles at the beginning of each book, occasional headings, and an index at the end of each volume that lists the standard chapters and the page they correlate to. There is nothing else—no other numbers and no other words. Reading the ESV Reader’s Bible is a joy. Yes, there is joy to be had in reading God’s Word at any time and in any variation—it is, after all, God’s word. But there is added joy in reading it in so beautiful a form. But there’s more to this set than beauty. There is also simplicity. Reading the Bible in so simple a form reminds us that it is first a book, first literature, first words from God to humanity. When left with only the text we are encouraged, maybe even forced, to read it as a text, as a book. After all, without chapter and verse markings it is difficult to zoom to a single chapter or verse. It would be nearly impossible to use this set to follow a reading plan like Mc’Cheyne’s which demands short, daily readings from multiple books. This Bible wants to be read it in bigger swaths, a book at a time or at least a section at a time. As we read we have to look for internal clues as to where thoughts begin and end, where sections start and close. We engage it in a different way, perhaps even a purer way. It’s rather a foreign experience to those who have known nothing but clutter. But what may at first be alarming soon becomes comforting. The ESV Reader’s Bible is an outstanding product, one to treasure, perhaps even for a lifetime. In its text it is the words of God. In its form it is very nearly a work of art. It is beautiful. It is simple. It is beautifully simple and simply beautiful. You can purchase the cowhide over board set exclusively at EvangelicalBible.com. It is expected to ship around October 14. You can purchase the cloth over board edition there, though it will be also available elsewhere.